I used to be so eager for Averi to learn how to read. I had visions of her sitting quietly in her room, reading to herself. While I sat in an entirely different room, enjoying the peace and free time. Averi also has taken to reading the magazine headlines while we wait in line at the grocery store. Granted, I don’t blame her. I also want to know about which Teen Mom is pregnant again, and how Theresa is doing in jail. Not so interested in Bruce Jenner though. Or any of the Kardarshians, for that matter. So as soon as we got home Averi asked what we could make. Thanks to her ability to read she went on Pinterest and kept tapping pictures till she found one that we actually had the ingredients for. 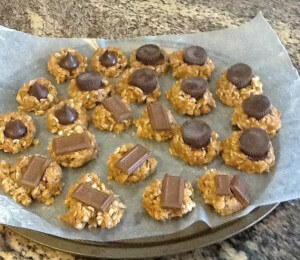 Peanut Butter Rice Krispies from Cooking With K.
Except it turned out we didn’t actually have the ingredients. It called for light Karo syrup, which I was sure we had. But we didn’t. 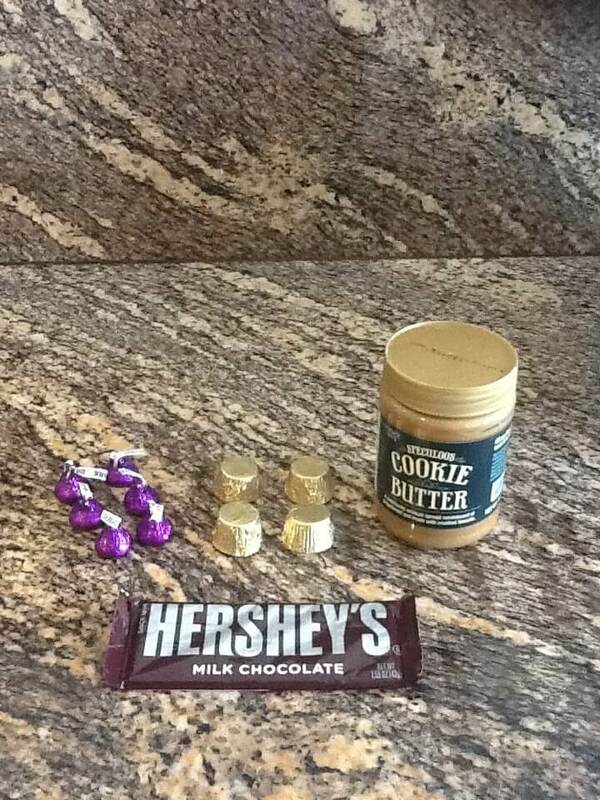 So I used honey instead, as I thought that would go nicely with the peanut butter. Then Averi decided she didn’t want to use all the Hershey kisses we had, and she brought out some Trader Joes Cookie Butter Cups. 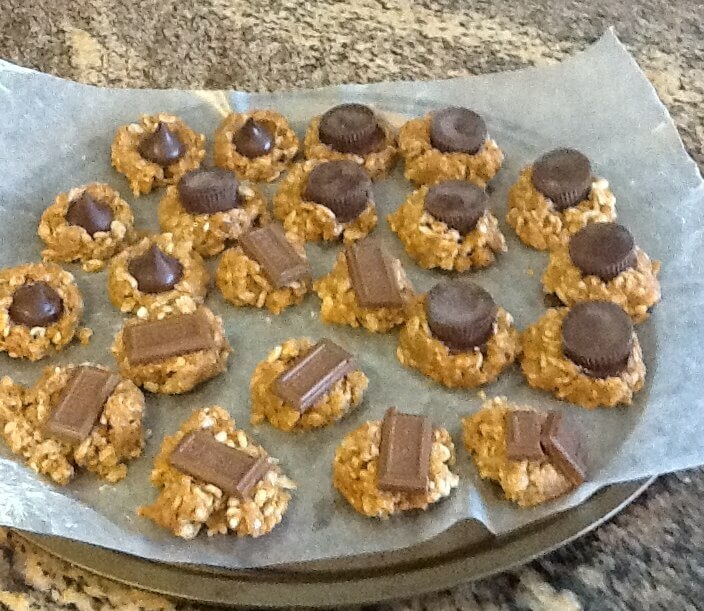 I thought that was a great idea, and decided to make half the batch following the recipe (with my one syrup/honey substitute), and half the batch using Cookie Butter instead of peanut butter and the Cups instead of the kisses. It seemed fitting as we were given the Cookie Butter by the awesome Miss Coco when she came to visit us. And today is her birthday. So even though we can’t share these with Miss Coco, we still “baked up some love” for her. Happy birthday, Miss Coco! So someone in Tucson please make some for Miss Coco and give Averi and I credit. Thanks! 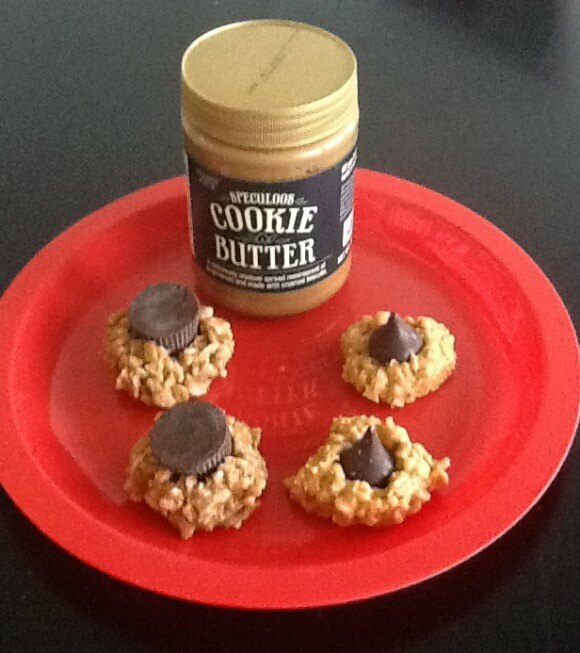 Put peanut butter in one mixing bowl, and cookie butter in another mixing bowl. In large saucepan, combine honey and sugar. Bring to a boil, and remove from burner. Add half of honey mixture to peanut butter mixing bowl and remaining half to cookie butter mixing bowl. Stir both bowls until smooth. Add 2 cups rice krispies to each bowl. Stir well, until completely mixed. Scoop mixture onto waxed paper. 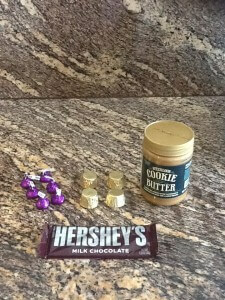 Immediately press chocolate kisses into peanut butter mixture and cookie cups into cookie butter mixture. Or mix and match. Tantalize the taste buds! Let cool completely. Then share some with Miss Coco and enjoy the rest.